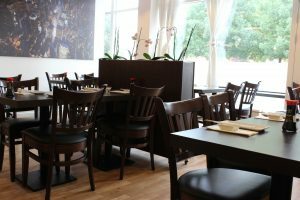 I’ve decided to to write restaurant reviews to help other vegans, who find it hard to dine out. I live in Denmark, so I understand that my readers abroad probably won’t get to try a lot of the restaurants I review. But maybe you can get some tips on how to eat out at the restaurants near you, or just see some of the cool vegan food I eat! The restaurant, I went to with my family, is called ‘Western Sushi’, and serves Japanese food (obviously). It’s not vegan, but pretty vegetarian friendly. The restaurant can be found at Sct. Bendtsgade 10 in Ringsted, Denmark. I’m going to tell you about how my experience was there as a vegan. This is what the restaurant looks like from the inside. Nice and clean. There was no people other than us, haha. To be honest, I’m pretty sure the restaurant is going to die soon, but it’s not because there’s anything wrong with the food, I promise you! We had reserved a seat, even though there was no need for that, so we got our table immediately. My mom explained to the waitress that I’m a vegan (since I’m really shy and terrible at talking to people, sigh). She didn’t speak really well Danish, but after a few moments she understood that vegan means no animal products at all. She said that she would be really happy to help us out. We were ordering from an ad libitum menu, so we could really choose any sushi and as much as we’d like. I had a few I wanted to try. 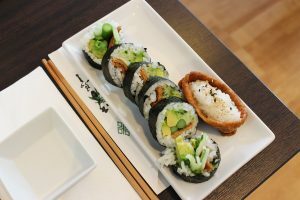 One sushi was with avocado, tofu, cucumber and baked asparagus. 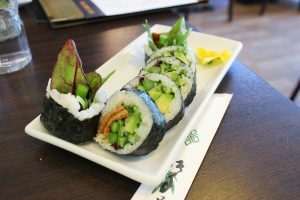 Obviously you couldn’t know if they baked the asparagus in a batter with eggs or dairy, so we asked the waitress, and she said that she could make a special sushi for me with raw asparagus instead, which was very nice of her. She just told us we could put a star for “special” on the menu, we ordered from, and she would make sure my food was vegan. After that we ordered a lot of different things. The food didn’t take long time to arrive. The first thing I got was this seaweed salad. Basically it was just seaweed, sesame seeds and lemon. I also think there was some kind of sauce on top. 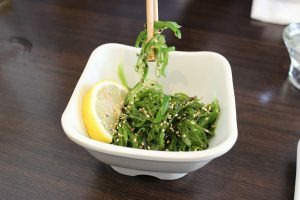 It tasted good and fresh, but honestly only the first bites, then the texture of the seaweed became a little too much. My dad liked it, too. The next thing that came was my sushi without the baked asparagus. It was a futomaki roll, meaning a thick sushi roll. I got 6 of those, but my mom ate one. This was super good! The avocado was delicious, of course, there was a nice crunch from the asparagus and freshness from the cucumber. The tofu had been fried in something sweet, I don’t know what, but I loved it! Oh, and the thing next to the sushis was a nigiri roll with tofu. Normally nigiri is rice with things on top, but strangely enough this nigiri was rice in a boat of tofu. 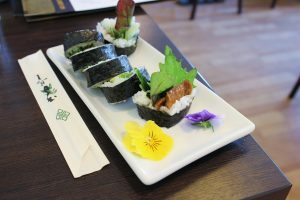 I thought it was going to be boring, but it was the same kind of tofu from the sushi, so it was nice and sweet and super delicious! And let me just tell you – I tried to eat with chopsticks, but I’m sorry… I can’t do it. I ate all the food with my hands, and I’ve actually heard that that is acceptable in Japan. I hope I haven’t offended anyone, haha. After a short moment I got more sushi. 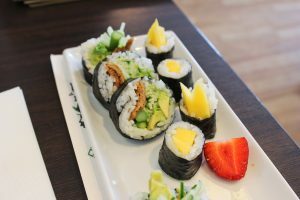 So just small sushis with mango, nothing else. Perfect, am I right? They were really good, the mango was not completely ripe, but they were still really tasty. I only got 4 of them, plus a little strawberry that came as a side with some of my parent’s sushis. And then… we got this. Edamame beans, steamed and lightly salted. These were the best beans I’ve ever had. Seriously, though. Small pieces of heaven. I don’t know how they could be that good? Give me the secret! 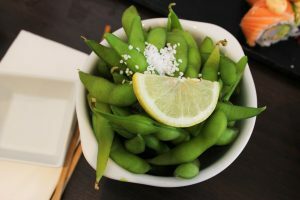 I have had whole edamame beans in the past, I just don’t remember. But, oh, boy… These were amazing. And sorry for the dead salmon in the background, but, you know, that’s how it is when the rest of your family aren’t vegan. 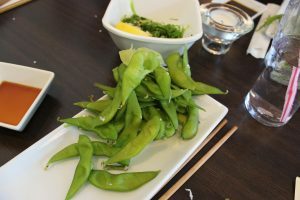 You just gotta live with it and continue to share love and steamed edamame beans. So, as I said before, these beans were really good. And I ate a ton of them. Literally. I could not control myself, guys. But after that, I still wanted more sushi. I ordered more of the futomaki sushis from before. This time I got them with lettuce and a few flowers, how cute! They were still very good (obviously), but I was starting to feel full, so I only ate 4 of them, and my parents finished the rest. So I would say I had a really good time at the restaurant. It was actually really easy and tasty to dine out as a vegan, and the waitress was really nice. We will probably come back. Remember that it’s really easy to make special requests, you could probably get anything you’d like in a sushi. 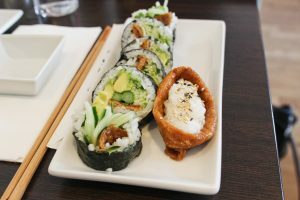 I was really happy about the whole meal, so if you ever come by, and the restaurant hasn’t closed, then Western Sushi is definitely a great option for vegans! I hope you found this post helpful. If not, then you you got to see some amazing food, at least. I’ll see you soon at the next restaurant I visit.